Maintaining regular communication with customers is crucial to a farm equipment dealer’s success. Today, thanks to telematics systems, it’s possible for the tractor itself to be part of that dialogue. Although this technology is only now beginning to emerge in farm operations, it holds great promise for deepening the relationships dealers have with their farm customers, and has potential for increasing dealer income. In the same way auto-guidance technology makes farmers more productive, telematics systems are tools dealers can use to make their operations more efficient. Telematics systems use the electronic communication networks embedded in modern farm machinery as well as GPS to monitor and report on information including machine location, hours, trouble codes and precision farming information. Data is transferred via cellular or satellite systems to the Internet or a mobile phone. For many years, telematics systems have been used by over-the-road truck fleet owners to keep an eye on drivers or by construction contractors to allow them to monitor data such as engine hours without having to travel to the machine. Until recently, the family farm wasn’t regarded as an area where this technology would find a strong market. That’s changing as equipment becomes more sophisticated. Phoenix Intl. is a John Deere-owned company that provides electronic components, including hardware for telematic systems, to a wide range of OEMs in the off-road and heavy-duty on-road equipment markets. 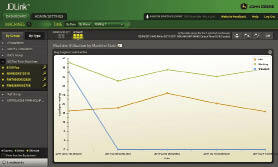 Its staff worked on the development of the Deere-developed JDLink telematics system. 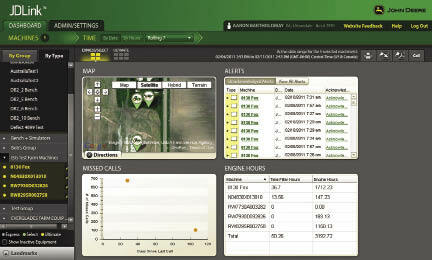 JDLink allows the tractor to send location and performance data via the web and cell phone. The latest telematics systems combine GPS technology with electronic communication systems embedded in modern machines to transmit data. Information such as engine hours and filter life can be reviewed on a website. AGCO’s AgCommand telematics service monitors machine location, engine and transmission status, hydraulic operations, combine operation information and other data. The user can view the information on a computer connected to the Internet or on a cell phone. Burchill believes telematics systems are gaining a stronger foothold in the off-highway equipment industry, and soon most machines will have some level of telematics content installed. The commitment by equipment manufacturers to offer it as a factory-installed feature on their machinery will likely prove to be the turning point for the technology’s adoption. With access to a farmer’s machine-specific data, the dealer will be better equipped to make equipment utilization suggestions. For example, if a “working” tractor is using half of its horsepower, it may be time for a larger implement. Precision farming specialists Trimble and Raven have also introduced telematics systems for use on the farm. 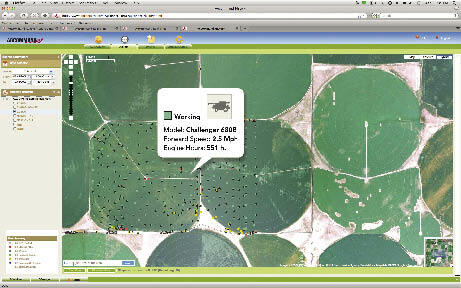 Trimble’s Connected Farm uses Farm Works software to manage data transferred to and from the farm equipment. Raven Industries has introduced a similar service called Slingshot. Slingshot works with cell phone networks and delivers real-time kinematic (RTK) global positioning system correction signals, data transfer, Internet connection and real-time technical support in the field. As one of Raven Industries’ largest resellers of precision-ag equipment, self-propelled sprayer manufacturer Equipment Technologies has adopted Slingshot RTK, setting up base stations that cover Indiana and Ohio. Over-the-road truck fleets have long used telematics systems for asset management, allowing supervisors to monitor what drivers were doing on routes. That technology can now help farmers improve efficiencies in the field. Dealers can use it, too, to help customers get the most out of their machinery investment. Telematics devices and services have evolved beyond reporting hour and location information to being able to provide machine diagnostic and repair assistance. The dealer’s technician no longer has to drive to the machine to determine the problem. For dealers and farmers, there’s a security measure, as well. Strunk is considering adding telematics systems to Altorfer’s demonstration and lease machines to ensure the equipment is where it’s supposed to be and is not being abused. Depending on the farm’s level of sophistication, data from the machine can be uploaded automatically into their business system, and can alert the farmer as well as the dealer that it’s time to change an air filter, for example. It also provides the opportunity to send data wirelessly for agronomic purposes, including mapping, fertilizing, seeding and more. Telematics systems can give dealers an edge when it comes to providing better solutions for their customers. 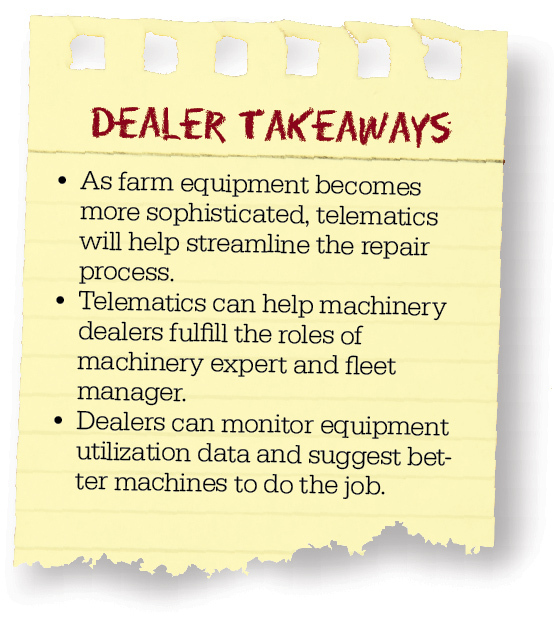 “Telematics helps open the door for dealers to better understand a customer’s machines and then sell a solution that is tailor fit for their farm,” says Bartholomay. A dealer could monitor how the farmer is using the tractor and recommend equipment that better fits the application. For example, data being sent to a dealer’s computer could show that a particular farmer is using only 50% of the tractor’s horsepower. That might suggest a larger implement that would make the farmer more productive. If he was using a 12-row planter on large fields, a move to a 24-row unit would allow the farmer to improve his efficiency. If a customer wants to buy a used machine with “X” hours, the dealer can review the data to see what’s out there. They now have a pool of vehicles to review, and can approach the equipment owners to see if they have been thinking of trading up. Or, a notification could be sent only to the farmer when it’s time to change the oil. At the next level of severity, the dealer could get the notification as well, and call to see how the farmer wants it handled. More severe maintenance issues could be programmed to have the system automatically call a technician. The dealer used a service application where hours were recorded and fed into a maintenance scheduler. Service department personnel could be alerted when a particular machine was due for maintenance, and they would follow up with the farmer. Typical farms are no longer a few hundred acres and a couple of tractors. As farmers expand their operations and add farm equipment to their fleets, telematics systems can help them, as well as their dealers, better manage the equipment. Northeast Iowa farmer Chris Barron recently ordered two John Deere 8R tractors with JDLink, and is looking forward to using the communication systems on the tractors to make running both units in the same field easier to manage while planting. “That is our main application,” says Barron, director of operations and vice president of Carson and Barron Farms. He also sees the ability to send data back to his main office becoming increasingly valuable as his farm operation grows. On his farm, Barron collaborates with several other farmers to maintain a shared equipment pool. “As that system grows over time, I see the need for telematics applications because of the way we will be structured. While Barron has a strong relationship with his equipment dealer, Waverly Implement, he believes using telematics will make it even better.